Very good. Dr Wolfson was direct and to the point. Did not oversell. The office could use some updating, but Iwould definately recommend him. Very good. Dr Wolfson was direct and to the point. Did not oversell. The office could use some updating, but I would definately recommend him. Clean, neat, efficient and professional. Staff is very Knowledgeable and Dr. Wolfson was excellent. Dr. Jeffrey Wolfson specializes in conditions affecting the foot. 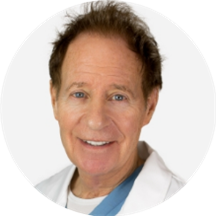 He has over 45 years of experience in the field of podiatry. Dr. Wolfson graduated from the NY School of Podiatric Medicine. During the period of the Vietnam War he was the head of Podiatry at Keesler Air Force Base. After leaving the service as a captain he joined his father in private practice on West 14th Street. The practice has expanded with more patients, more staff and newer technology, but Dr. Wolfson continues the practice in the family tradition. My experience at Dr. Wolfson's was great. All of the staff members are incredibly welcoming and very helpful. I went in for a procedure and they all made me feel comforted and well cared for. Dr. Wolfson did a great jobon the procedure - it was quick and as painless as could be. Highly recommend Dr. Wolfson! Dr. Wolfson and his staff were friendly, professional, and efficient. He thoroughly examined foot and gait then provided a straightforward diagnosis and treatment plan. Dr. Wolfson was not only so friendly with a great bedside manner that put me at ease, but he also quickly identified my foot pain that has been plaguing me for weeks. Fast treatment with little impact to my daily life or activities. Would highly recommend.